Do Home Security Cameras Really Prevent Crime? Taking care of your family and your home is probably one of your top priorities. Therefore, you might be considering purchasing a surveillance system in order to protect your home. However, you might be wondering the same thing that many homeowners ask: Do home security cameras really prevent crime? It is perfectly normal to wonder if it is worth the investment to install a security camera surveillance system and other security equipment on your property, but you should realize that purchasing and installing this equipment is a valuable investment that can help protect your family and home from being the target of theft, burglary, vandalism and other crimes. Although you cannot count on a security camera system to eliminate crime completely, it is an investment that you should consider. By installing security cameras and other security-related equipment on your property, you can make a major difference and take serious steps toward keeping your property and family safe from crime. Criminals typically look for the easiest targets when they are planning on committing their crimes. In most cases, these individuals don’t want to be caught, so they usually look for homes that are easier to break into. This allows them to commit their crimes without as much of a concern for getting caught by the local authorities. Therefore, having home security cameras is a great way to prevent criminals from committing crimes on your property. For best results, you should consider hanging them in a location where they can be seen; if criminals can see your security cameras, they will know that they are under video surveillance, and they will think twice about doing things they shouldn’t do on your property. Instead, they will consider heading to another home that doesn’t have this type of security. When hanging your security cameras, you should make sure that they are high enough off the ground that they cannot be tampered with. A sneaky and experienced thief might consider stealing your camera or doing something to obstruct the camera’s view. Therefore, you should consider hanging your outdoor surveillance cameras on high poles, tall trees or high up on the exterior of your home. Along with using security cameras to deter crime, there are a few other things you can do in order to prevent criminals from being attracted to your home. Installing ample lighting on your property can help keep thieves, vandals and other criminals at bay, and posting signs that your property is under surveillance may also be more effective than you think. Although you can’t depend on security cameras and other security methods to completely prevent crime on your property, you should know that taking these precautions can make a major difference. 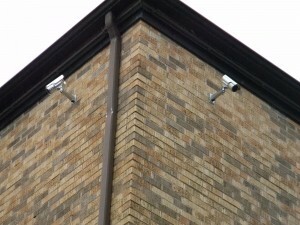 Since some criminals are brave enough to attempt crimes on a property that is protected by surveillance cameras and since some simply don’t realize the cameras are there, there is still a possibility that crimes will be committed on your property if you have a surveillance system, even though these chances are drastically reduced. Fortunately, however, having security camera footage of the crime that was committed can have a lot of advantages. First of all, the local authorities will be more likely to find the person who committed a crime on your property if they have evidence. Your video surveillance footage could help the police identify the individual who committed the crime, which will make looking for him or her much easier. Not only will there be more of a chance of the criminal being found, but your local prosecutors will also be more likely to convict the individual if they have solid video evidence. This can help you retrieve your items back if anything was stolen, and it can help bring forth justice after you have been the victim of a crime. Video surveillance footage also helps prevent crime in the long run because it allows local authorities to get criminals off the streets. This means that the criminals will not be able to commit crimes in the near future, and it will help teach them a lesson about committing crimes. In the long run, this can be highly beneficial for your neighborhood and the entire community. These are only a few of the benefits that go along with installing a home security camera system on your property. Along with helping to prevent crime in and around your home, it can also help you feel safer and more secure, which is worth a lot in itself. You are sure to be surprised by how much safer and more comfortable you feel once you have these security cameras and other security-related equipment in place, and you could prevent a crime that you don’t even know about by preparing yourself and your home. Therefore, you shouldn’t put off installing a surveillance camera system. Although it can be easy to put these things off, it is important to take care of home security as quickly as you can. You never know when something could happen, and you could be stuck in a bad situation if you don’t have security equipment in place when a criminal decides to strike your neighborhood. By taking precautions before something happens, you could prevent crimes from happening in and around your home in the first place, and you will be far better prepared to handle the situation in the event that a criminal does decide to take his or her chances on your property. You don’t even have to worry about spending a fortune in order to purchase the necessary equipment; in fact, you might be surprised by just how nice of a system you can purchase on a budget if you are willing to shop around and if you work with the right security company. Contact us today for more information about security systems in your home.